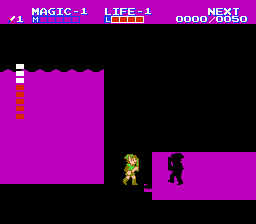 NES Zelda II: The Adventure of Link (USA) "warp glitch" in 05:31.92 by TASeditor, Arc & Inzult. However, the game also has a large glitch which produces massive speed when both Left and Right are pressed at the same time; due to the use of this and other glitches, most of this run features Link racing across Hyrule so fast that the screen can't keep up, and inexplicably warping between places that shouldn't be connected. Only a few items and one spell are collected, and the only enemy ever fought is the final boss. Luckily, he takes the same amount of damage no matter what level attack you have. In this run, Arc improves on TASEditor's previous efforts by four seconds due to a recently discovered encounter glitch. See the author's comments for more details. We also have a run that completes the six palaces without using the Left + Right glitch to turn the game into a barely comprehensible mess (but does allow the use of glitched warps) and another run that disallows both the Left + Right glitch and the use of glitched warps.